The Napping allows you to look for sensory differences between products. Differences are on global sensory characteristics and should be complemented with a verbalisation task to ease the understanding of the differences. It offers greater flexibility, as no trained panel is needed. The sorting task: each taster is asked to position the whole set of products on a sheet of blank paper (a tablecloth) according to their similarities/dissimilarities. Thus, two products are close if they are perceived as similar or, on the contrary, distant from each other if they are perceived as different. Each taster uses his/her own criteria. The verbalisation task: After performing the napping task, the panellists are asked to describe the products by writing one or two sensory descriptors that characterize each group of products on the map. Panels should be composed from 12 to 25 tasters according to the judge’s experience with the product and to the objective of the experiment. For example ten farmers-bakers should be enough to have reliable results as they are used to eat and taste bread. In case of consumers, a panel of twenty could be more adapted. No more than ten products should be evaluate simultaneously. A random, three-digit code should be assigned to each sample. Samples are presented simultaneously and the assessors can taste as much as they need. Napping data lead to a quantitative table. The rows are the products. This table presents the number of panellists (\(i\)) sets (one set for each panellist) of two columns corresponding to the horizontal and vertical coordinate (\(X\), \(Y\)). Two columns correspond to each subject (i.e. person that taste) \(j\): the X-coordinate (\(X_j\)) and the Y-coordinate (\(Y_j\)) for each product. Sensory descriptors are coded through a “products x words” frequency table. First a contingency table counting the number that each descriptor has been used to describe each product is created. Then this contingency table is transformed in frequencies so that the “word frequency” is a qualitative variables with the number of words cited as modalities. To analyse this kind of data, a Multiple Factor Analysis (MFA) should be performed. Each subject constitute a group of two un-standardised variables. The MFA led to a synthesis of the panellist’s tablecloth. Two products are close if all judges consider them close on the napping. The more the two first components of MFA explain the original variability, the more the judges are in agreement. The frequency table crossing products and word frequency is considered as a set of supplementary variables: they do not intervene in the axes construction but their correlation with the factors of MFA are calculated and represented as in usual PCA. The data frame has the following columns: juges, X, Y, descriptors, germplasm, location. The descriptors must be separated by “;”. Any other column can be added as supplementary variables. Then, you must format your data with format_data_PPBstats() and type = "data_organo_napping". Argument threshold can be set in order to keep only descriptors that have been cited several time. For exemple with threshold = 2, on ly descriptors cited at least twice are kept. descriptors the vector of descriptors cited knowing the threhold applyed when formated the data. 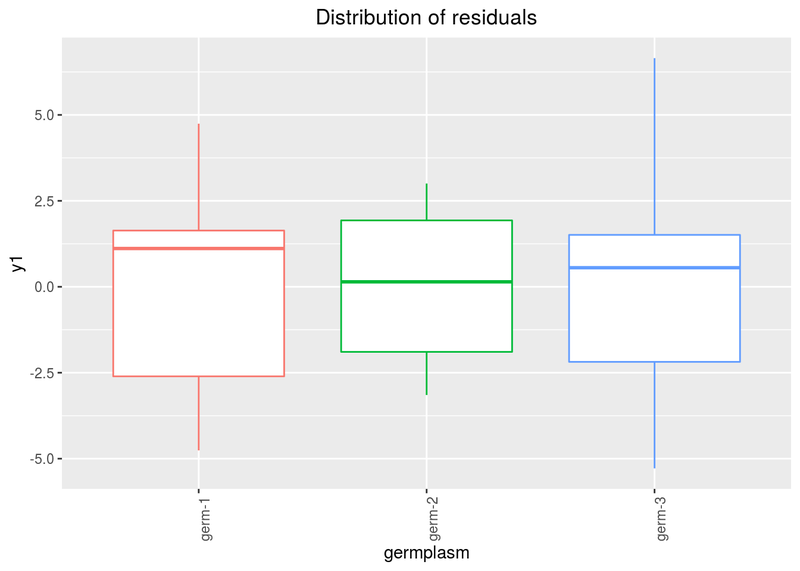 First, you can describe the data regarding the descriptors for each germplasm for example. 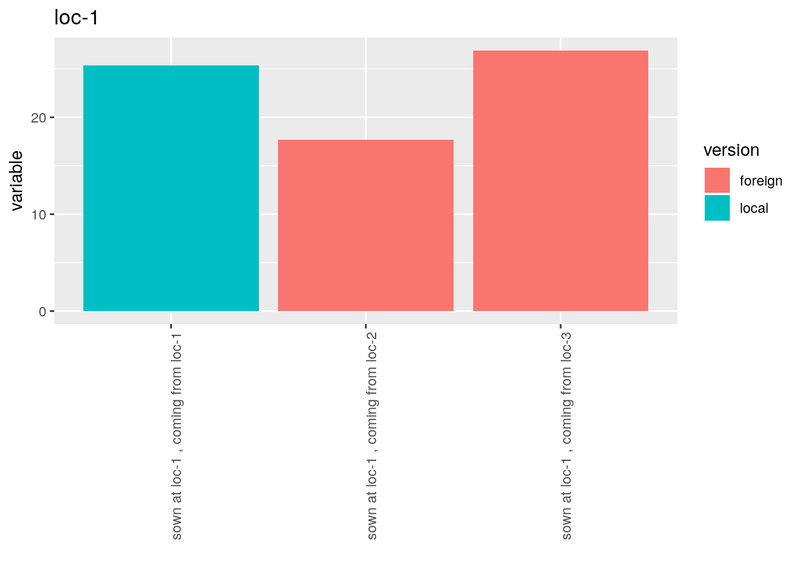 To run the model on the dataset, used the function model_napping. The tests to check the model are explained in section 3.1.2.1.2. 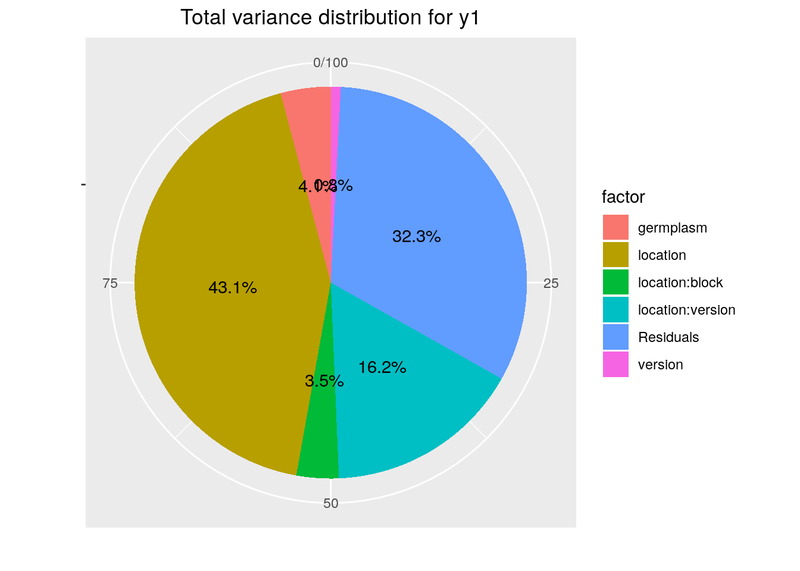 The biplot represents information about the percentages of total variation explained by the two axes. It has to be linked to the total variation caught by the interaction. 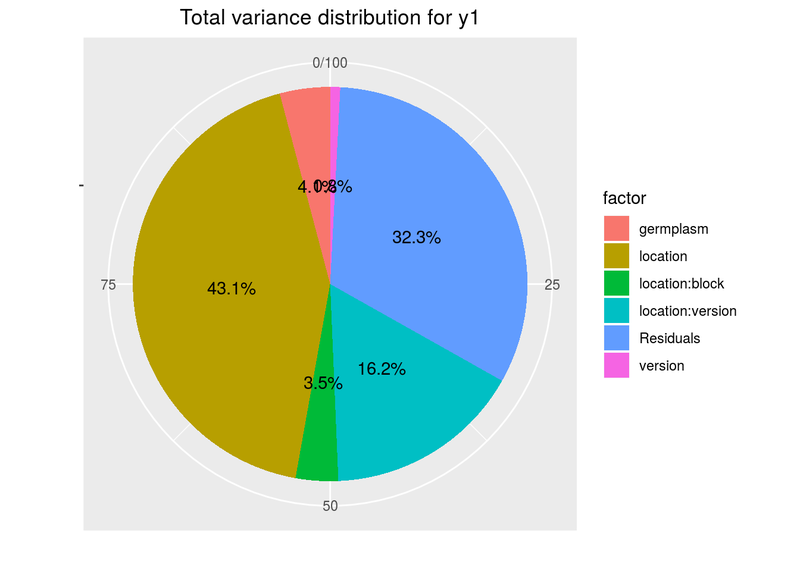 If the total variation is small, then the biplot is useless. If the total variation is high enought, then the biplot is useful if the two first dimension represented catch enought variation (the more the better).